Eifel, a plateau that occupies parts of southwestern North Rhine-Westphalia and northwestern Rhineland-Palatinate between the Mosel, Rhine, and Roer rivers, was probably even before the Reformation a center of those groups who opposed the worldliness of the Catholic Church and who are now, following the example of Ludwig Keller, usually known as the old evangelical brotherhoods. This would account for the letter written in 1531 by Sebastian Franck "to several in the Eifel at the request of Johann Beckestein" (Rembert, 226-228). Later on the Anabaptist movement must also have found a wide following here. In the 16th century there were many Anabaptists in and around Monschau and in the Schleiden area. Thomas and Zillis worked here as apostles. The Anabaptists were sorely oppressed. One of the martyrs in 1552 was Maria of Monschau (Montjoie); see also hymn No. 25 in the Ausbund). At the Strasbourg conference of 1557 there were delegates representing about 50 churches "from the Eyfelt to Moravia." Daniel Notemann built a hammer for "red copper" in Pleushütte near Einruhr, but settled in the Neuwied congregation. In 1711 there was still a congregation in the Eifel highlands, which met in Einruhr. In the course of the 18th century several Mennonites of Einruhr were baptized at Krefeld. The last member there was Daniel Becker, who died in 1886. In 1922 there were living in the Eifel region (between Trier and Andernach) about 14 families, some of whom came from the Palatinate about 1827 and settled on leased farms. There were Mennonites in Eischeidhof near Daun, Jägershof near Trier, Jakobstal near Andernach, Kalbergerhof near Trier, Kaltschick near Bassenheim, Leyerhof near Königsfeld, Lissem near Bitburg, Mayen, Pönterhof near Andernach, Spangdalem near Wittlich, and Unkel. 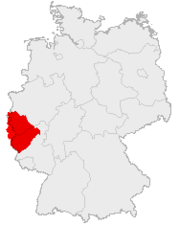 The Mennonites in the eastern part of the Eifel belonged to the Neuwied congregation, and those in the western part formed a congregation with the Mennonites of Luxembourg, who are descendants of Eifel Mennonites. They held their meetings in the homes of the members. Hege, Christian and Christian Neff. Mennonitisches Lexikon, 4 vols. Frankfurt & Weierhof: Hege; Karlsruhe: Schneider, 1913-1967: v. I, 547. Monatshefte für Rheinische Kirchengeschichte (1914): 21 ff. ; (1917): 161 ff. Ottius, Johann Heinrich. Annales anabaptistici h. e., Historia universalis de Anabaptistarum origine, progressu, factionibus et schismatis, ... videtur. Basel, 1672. Scheibler, Walter. Geschichte der Evangelischen Gemeinde Monschau 1520-1939. Aachen : Rehnisch, 1939, especially the chapter "Die Wiedertäufer im Monschauer Land." State archives at Düsseldorf. Jülich-Berg: II, 254; III, 980. Neff, Christian and Wilhelm Niepoth. "Eifel (Germany)." Global Anabaptist Mennonite Encyclopedia Online. 1956. Web. 19 Apr 2019. http://gameo.org/index.php?title=Eifel_(Germany)&oldid=144982. Neff, Christian and Wilhelm Niepoth. (1956). Eifel (Germany). Global Anabaptist Mennonite Encyclopedia Online. Retrieved 19 April 2019, from http://gameo.org/index.php?title=Eifel_(Germany)&oldid=144982. Adapted by permission of Herald Press, Harrisonburg, Virginia, from Mennonite Encyclopedia, Vol. 2, p. 170. All rights reserved.